5793 labyrinths found. Showing 3301-3320. Sorted by country, state, city, then zip/postal code. From Bemidji, follow the signs to Bemidji State Park. Once on County Road 20, continue driving east (straight) past the park entrance. Drive for ca. 4 more miles until you see the large, wooden Concordia Language Villages sign on the left side of the road. Turn in and follow the road to the right until you get to Centrum where all visitors are registered before being guided around the site. Our "Labyrinten" is a replica of a labyrinth found on the shores of Holmengra in Finnmark, Norway (along Jarfjord, near the city of Kirkenes) - the northernmost county in the country. The country has fewer than ten such labyrinths, and of those, Holmengra is the country's easternmost, located very near the Russian border. The labyrinth has been dated by the Tromso Museum of the University of Tromso as having been built between the years of 1000 and 1500. Who built it and for what purpose is unknown. 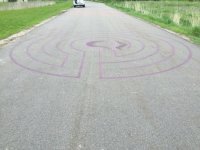 The labyrinth was recreated by US and Norwegian youth in 2004 as a landmark for Skogfjorden, The Concordia Language Village's Norwegian language program. Typically 10 a.m. - 2:00 p.m. (CT) Tuesday - Thursday during the summer months (it is good to call ahead). Otherwise by appointment during the rest of the year. Skogfjorden youth based on a map of the original labyrinth produced by Troms� Museum in Troms�, Norway. Skogfjorden youth together with scouts from Norway. Available when school is not in session. 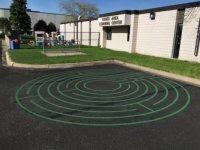 The labyrinth is on school grounds and may be available when school is not in session. Karner Blue is a school for special needs students with Autism, emotional and behavioral disorders, and cognitive disabilities. Painted in blue parking lot paint on the asphalt fire lane behind the school. Painted in orange traffic paint on the asphalt fire lane behind the school. Available when the school is not in session. 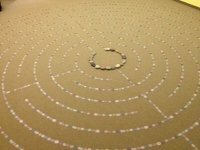 Concentric 5-circuit Partner Stroll Labyrinth designed by Lisa Gidlow Moriarty of Paths of Peace. In this unique pattern two persons walk side-by-side on adjacent paths as one is entering the labyrinth and the other is returning from the center. Painted in purple traffic paint on the asphalt fire lane behind the school. 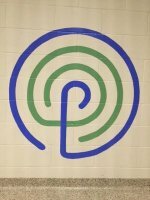 The labyrinth is painted on the wall of the quiet calming room at Karner Blue Education Center, a school for special needs students with Autism, emotional and behavioral disorders, and cognitive disabilities. 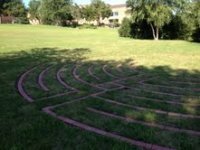 The labyrinth is popular with the students who trace the paths with their hands to calm themselves when they are anxious. 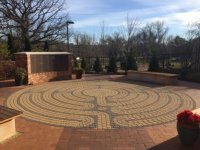 Monday through Saturday: 10:00 a.m. to 9:30 p.m.
A Long Term Care and Assisted Living Campus, we have lap-sized labyrinths for use with residents in both the Care Center Chapel and the Meadow Woods Chapel. Our labyrinths are designed for those with limited mobility or vision impairments. Check with receptionist at front desk to be sure chapel is available. Labyrinths may be used anywhere on campus. This small, whimsical labyrinth path is made of 8 inch square pavers, many of which are engraved with names. 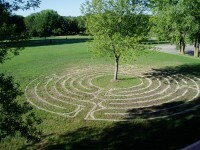 The labyrinth paths winds through trees and is not a walkable labyrinth, but a visual installation. 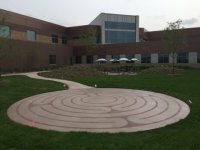 A second labyrinth for walking meditation is located on another part of the NWHSU campus. 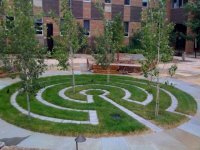 The labyrinth is located between the parking ramp, Fine Arts Building, Science Center, Student Center and Parking Lot 3 in the College Green. This is an aquatic labyrinth feature that is not walkable. The labyrinth is mowed in the south churchyard. 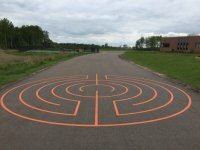 The labyrinth is located in the parking area on the west side of the building near the basketball court. This is a private, secure psychiatric setting for children and adolescents. The labyrinth is not open to the general public. 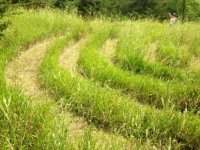 Two mazes available - a corn field maze and a straw bale maze. Proceeds support local charities. From 35 E and County Road 11, head North on County Road 11. Turn left on 130th Street. PCA is on the left .5 miles. - From 35 W and Burnsville Parkway, head East on Burnsville Parkway, turn right on Nicollet to a left on 130th Street. PCA will be on the right .5 miles. Circle of Peace (TM) design by Lisa Gidlow Moriarty, 7-circuit concentric circle pattern. The Metamorphosis Center is dedicated to possibilities and to making positive changes in your life. Visit our website for more information about our offerings. This is a meditation center with an indoor walking labyrinth. 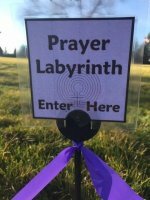 We offer open labyrinth walking and courses on labyrinth walking. Please see our web-site for current offerings or call us directly for a personal appointment.